All these peachy pink walls are giving me the blues, but not in a weepy wimpy way. More in a, I must have cobalt blue velvet stat, kind of way. This fabulous vintage tufted sofa with brand new blue velvet upholstery just popped up at a local dealer's shop. Sadly, I know this particular dealer will be charging 1st Dibs prices. Double sadly, that upholstery in my house would go from pristine to a jelly smeared nightmare in 3.2 seconds. But look how good FloLo makes peacocky blue look with a juicy pink palette. Delish. 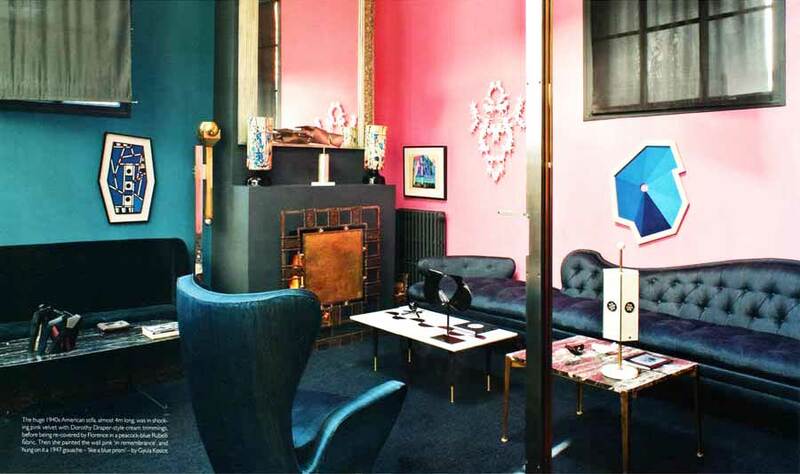 Almost as good as my girl Naomi Stein's fabulous Klein blue and pantone pink office nook. Genius, no? Go check out the rest of her amazing apartment reveal over at Design Sponge. And then please report back to let me know where I can get an amazing kid friendly blue sofa.